"There can be no tougher or more unflinching play than Oleanna. The original ending is, brilliantly, 'the last twist of the knife'. She gets up from the floor ('Don't worry about me. I'm alright') and goes straight for the throat. The last line seems to me the perfect summation of the play. It's dramatic ice." Harold Pinter, letter to David Mamet, 26 April 1993, personal archive. 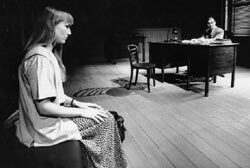 "The danger with the play is that it can easily seem a partial, loaded, one-sided attack on the student and on female solidarity in general .But Pinter's production scrupulously avoids that trap by giving equal weight to both sides of the argument. It is clear from his staging that the professor not only dominates the student intellectually but it physically drawn to her. But it is equally clear, from the way she sits astride his desk in the second act that she is terrifyingly conscious of her new-found authority. By restoring Mamet's original ending, in which the professor is forced to confess his failings, Pinter also brings out the pain and tragedy of the situation." Michael Billington, The Guardian, 1 July 1993. "By reverting to Mamet's original curtain, Pinter reminds us that this is in the end a play about who shall be given the power of deciding what things mean." Sheridan Morley, The Spectator, July 1993. "The first night when David Suchet beat [Lia Williams] up, the men in the audience really gave her a rough time, and cheered. She wasn't expecting it [...] I had to say to her, it's not you. The only thing you can do is stand up for yourself and say I'm above all this, as the character does. She's indomitable, whether you like her or not. She can say, you1ve beaten me up, I'm hurt, but nevertheless you're going to make this statement. When that happens in our last five minutes, the audience is absolutely silent. Lia has really triumphed too. It's not very pleasant being detested on stage, to find the audience antagonsitic." Harold Pinter to Mel Gussow, Conversations with Harold Pinter, London: Nick Hern, 1994, pp.148-9. "Not a word in this quietly spoken production is redundant. It is ideal material for Pinter to direct: always disturbing, frequently menacing, but only at the end breaking into violence. Pinter's control is immaculate." Malcolm Rutherford, The Financial Times, 2 July 1993. "Options for short-circuiting the antagonists into black and white are rigorously obliterated in Harold Pinter's production. Its unspoken premise is that the characters are treading a sexual minefield. Anything may trigger it off." Irving Wardle, The Independent on Sunday, 4 July 1993. "Reading the printed text, you feel, or at least a complacent male like myself feels, that Mamet has painted his play in black and white [...] In Pinter's brilliantly controlled production, in which every line is made to count and the tension is screwed up like a ratchet, the piece seems more subtle." Charles Spencer, The Daily Telegraph, 2 July 1993.